Everyone needs a helping hand. Though the citizens of our country pride themselves on personal autonomy and independence, that is not what God wants for His followers. He desires that we work together, relying on each other and on Him for our strength. All of the most famous Bible heroes understood this principle. Listen to this story from Exodus 17:8-16. Droplets of sweat trickled down the gray-haired man’s face as he strained to keep his arms outstretched. The wood staff that he had carried for many years felt like a rod of iron and threatened to cause his shaking arms to collapse under the weight. How long had he been standing on this hilltop with the pressure of the Israelite army’s lives dependent on his aching arm muscles? He didn’t know, but one thing was certain. Every time he lowered his arms to rest the enemy army got a leg up on the Israelites. Moses’ people, the children of Israel, were camping at Rephidim. It was in this place that the Lord had miraculously provided the thirsty people with fresh clean water out of a solid dirty rock. While they were resting here, the army of the Amalekites had come and attacked them. So Moses had commissioned Joshua to assemble an army and confront them in battle. He would climb a nearby hill overlooking the battlefield and seek God’s help for deliverance. Moses understood that God was the One Who could and would give the Israelites this victory, and his raised staff was a symbol of his appeal for God’s divine intervention. When his arms were raised the Israelites were winning, but when he put them down the Amalekites began to win. As the hours stretched on his hands and arms became so weary. How could he ever keep them raised until the battle was over and victory was assured? 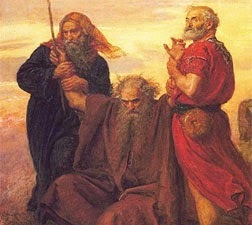 The answer came when two of Moses’ closest friends and advisers stepped in to help. Aaron and Hur recognized the trouble their leader was having and quickly came to his assistance. They rolled a stone over to where Moses stood so he could rest his weary body. Then they each grasped one of his failing arms and held them steady until the setting sun lowered itself behind the hills and Joshua overcame the Amalekite army with the sword. Moses and the Israelites won a great battle that day through the presence and help of their great and mighty God. Each person played an important part in the battle, but the victory belonged solely to Lord. The story was written down on a scroll so that it would always be remembered. when you are too weary even to speak a word keep in mind that you have brothers and sisters in Christ who can hold you up before the Father. Ask for their prayers. Ask for their help. Don’t try to do it alone because in God’s economy everyone needs a helping hand.